What Does 100% Arabica Coffee Really Mean? Posted on June 12, 2015 by Hawaii's Local Buzz. You’ve probably seen the statement “100% Arabica coffee” on the packages of some of your favorite brews, but do you know what this statement means? It actually refers to the species of coffee the package contains. There are more than 100 species of coffee, and Coffea arabica is one of them. Arabica has a more enjoyable taste. Robusta is often said to have notes of burnt tires and rubber — that’s certainly not appetizing! Arabica coffees contain about 60% more lipids than robusta coffees. It’s lipids that give coffee its smoothness and allow you detect more subtle nuances of flavor. Robusta’s high caffeine content adds to its bitterness. 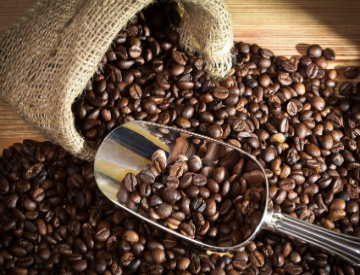 Arabica beans, while still containing a substantial amount of caffeine, are less caffeinated and thus less bitter. If you purchase cheap, store-brand, pre-ground coffee, it will often contain primarily robusta beans, simply because robusta is easier to grow. Robusta is used as a filler and cost-reducer in these products. There are higher quality robusta coffees available, but they only taste as good as a low-end, pure Arabica coffee. Basically, when a coffee is labeled “100% Arabica” as is our Hawaiian Ka’u coffee, you know it contains only the best species of beans. However, there are many other factors that determine the flavor nuances of a specific coffee, such as the altitude and soil quality where it is grown. Our Hawaiian Ka’u coffee is grown in rich, volcanic soils and fresh mountain air, making it some of the best coffee you’ll ever taste. Visit our website, and start sipping deliciousness today. Mahalo for your kind words, both about our products and our newsletter. I especially appreciate the comment about the newsletter because I’m the one who writes it and it’s nice to know folks are out there reading it! The lady who was womaning our farm stand, if she had her “guard dog” GG, was Trudi. She’s actually on vacation for the rest of this month back on the mainland but I’ll be sure to pass on your compliment to her when she returns. Hope we get a chance to see you at the farm again sometime! that’s better than Robusta, as you explained. But my can says only ‘”100% Arabica.” Should I also be looking for “100% Colombian” also? This reply is so late — I’m very embarrassed. Arabica is a species of coffee tree and can be grown anywhere coffee is grown. The designation 100% Arabica just means that the beans were all from trees in the “Arabica” family. This wikipedia article might be helpful in understanding what the designation “Arabica” means. So — if you’re specifically looking for Colombian coffee, you also want to see what the percentage of the beans are FROM Colombia. Both Arabica and Robusta species of coffee plants are grown in Colombia. Of course, we recommend buying Hawaiian, rather than Colombian, coffee, and specifically buying our 100% Arabica, 100% Hawaiian, 100% Ka’u (the district on the Big Island of Hawaii where our coffee is grown) coffee. It’s a lot more expensive than the cans of Colombian coffee you can buy at Sam’s Club, but we think it’s worth the price.